Although this is an express bus between Jakarta Soekarna-Hatta Airport (CGK) and Gambir Station, I have seen, in all my trips, passengers boarding and alighting at places along the main roads where it is convenient for the bus to stop. *Frequency may be affected due to traffic jams. From Airport: Unknown, but should be similar to Gambir. Reservations are neither necessary nor possible. Just show up and buy a ticket at the counter, or hop on and pay the conductor on the bus. Upon arrival at the terminal, just walk out to the roadside area and find the signs pointing to DAMRI. In Terminal 2, it’s located at a dedicated bus stand at the end of the terminal. For Terminal 1A, 1B, 1C and 3, just go to the official bus stops by the road. The Terminal 2 bus stand. Here, you can buy your tickets in advance from the DAMRI counter and staff at hand will announce each bus’s destination as they are ready for boarding. Many buses can depart at once to different destinations. If the bus heading to your destination is leaving, just hop on. Tickets are also sold on board the bus. In doubt, ask any staff. No unofficial ticket sellers are around, a huge plus point for visitors. The bus to Gambir getting ready to depart. A ticket bought from the counter at the bus terminal. The ones bought on board will be white. Heading back to the airport, the DAMRI counter is located in the middle of the car park. Follow the signs if you are coming from inside the station. There is a priority queue for airport passengers, head to the dedicated counter to get your ticket almost instantly. 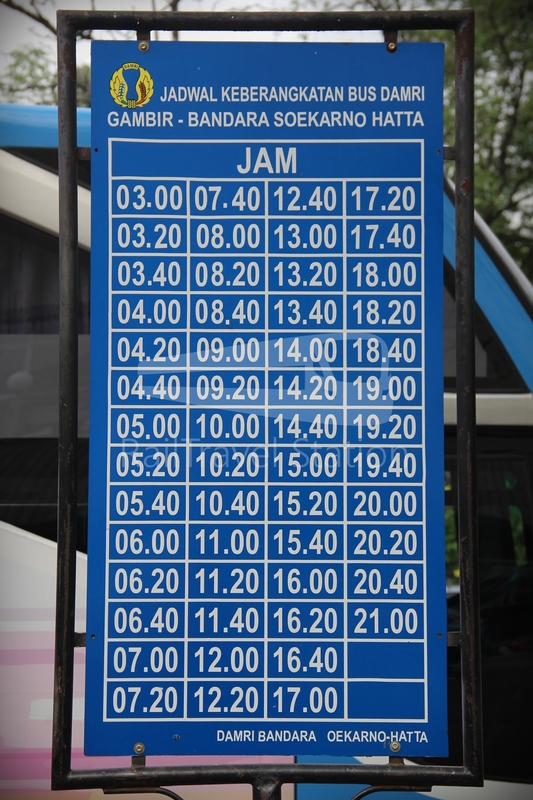 The timetable for buses departing for Jakarta Soekarno-Hatta Airport (Updated: Nov 2018). You will receive a similar ticket as the one you got from the airport. The bus will park opposite the counter, the counter staff will point out the one departing next. Just follow your other fellow passengers if in doubt. How do I get onto the KRL Jabodetabek from Gambir? The KRL Jabodetabek does not stop at Gambir station. The closest KRL Jabodetabek station to Gambir is Juanda. Take TransJakarta BRT Service 2 or 2A from Gambir 2 to Juanda. How do I get onto the KRL Jabodetabek to Gambir? Take TransJakarta BRT Service 2 or 2C from Juanda direct to Gambir 2. Alternatively, take TransJakarta BRT Service 2A, 3, 5C or T12 from Juanda to Harmoni Central Busway and change to Service 2 or 2A to Gambir 2 bus stop. How do I pay for the TransJakarta BRT? Cash is NOT accepted. You must buy a contactless card at the counter before entering the TransJakarta BRT system if you do not have one. What are the fares for the TransJakarta BRT? Flat fares are applied throughout the network based on entry time, regardless of distance travelled. You only need to touch in to the system. Exiting the system is by one-way turnstiles. Zoom in at Gambir to view the connecting TransJakarta BRT routes. At Wath time is the latest bus DAMRI (airoport –> Gambir) ? Our plane is landing at 10:15 pm. Hi, there is conflicting information online saying 9pm, 10pm and 11.30pm. I would advise just getting a taxi from the airport if you have big luggage or travelling with many people. Even if there are buses till 11.30pm, you will incur a midnight surcharge when you transfer to a taxi when you arrive at Gambir station. You could still try heading to the bus terminal to enquire though. Will arrive at Gambir at 4:30 am and have to be at airport latest 8:45 am to catch my flight. I’m traveling tonight and just found this page. Sorry for the late reply. Thanks for dropping by! the buses leaves every 15 minutes to airport, from gambir actually you can go tanjung karang railway stations in lampung, from there you can go to kertapati railway stations (Palembang). Hi there. Gambir (Jakarta) is located on Java island while Lampung is located on Sumatra island. You require a train to Merak from Jakarta Tanah Abang (no trains from Gambir), followed by a ferry and bus transfer to get from Gambir to Tanjung Karang. Hello there, I guess I’m missing the words, what I mean is from gambir there also damri to tanjung karang stations , and it’s far more faster than using trains, and beside only 3rd class available from tanah abang railway station to merak railway station. Hi xboogiex, Tanjung Karang is located on Sumatra island which requires a 2 hour ferry ride across the sea from Merak. Hello there, don’t get me wrong okay, I just wanna inform you that there’s another Damri route that linking from Gambir station (Java) to Tanjung Karang (Sumatra). Based on my experience I used Damri to Tanjung Karang, coz its faster, comfort, & you don’t have to transit anymore, the bus dropped you straight in front Tanjung Karang stations, you should try it one day, if KTM have laluan pantai timur as their jungle railways, we have Divre III (Lampung – Palembang) as our jungle railways. Hi, I’ve checked with some sources, and yes, my sincere apologies, there is indeed a bus crossing from Jakarta Gambir in Java to Tanjung Karang in Sumatra. The bus will go on the ferry, where passengers will enter the passenger room on board the ferry. No probs bro, Damri is also used as a linking transportation from Banyuwangi station to Denpasar (Bali). Hi, it may range from 1 to 2.5 hours, depending on traffic. Hi, may I know gambir station have commuter service ? Have taxi service ? Thank you. No Commuter Line. Busway and taxi available. I would like to know if there is any direct bus-Domari to “Jl. Pulo Asem V,” at 22.30 from (CJK) Jakarta airport, cos I have booked a hotel there. Please also inform the taxi fare.